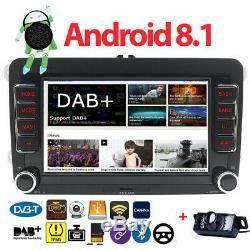 Car Stereo Audio For VW Radio Quad-Core 7''Android 8.1 1024600 SKODA SD CADDY. Power Supply: DC 12V (allowance range: 10.8-14.5V). Front panel Size: 220mm(Top width)128mm(High)210mm(Bottom width). Operation System: Google Android 8.1.0. CPU: MTK8227L 1.6GHz 4. Capacitive or Resistance Screen: Capacitive. Main Menu Status Bar display: Can be changed to Music/Radio/BT-Stereo Player. WiFi: Built-in WiFi Modem, support 802.11b/g/n. Explorer: Opera, UCWeb, SkyFile, Dolphin and more explorer for your selection. Online Entertainment: Online Video, TV, Movie, Music, Radio, Video Chat. Online Navigation: Online Google Maps Navigating. Online Games: Yes, online play or you can download it from google play store. Online Communication: WeChat, Twitter, Facebook, Skype, Gmail, Whatsapp etc. Read and edit Office Software: Yes, support Word, Excel, Powerpoint, PDF, TXT. 264, DIVX, XVID, RM, RMVB, MKV H. 30 formats, Playing internet video directly (while downloading). Could play via song list. Other: LRC synchronized display; ID3 search; Search by files; Album Picture; User-defined audio effect. Audio IC: Top Global Cirrus IC, independent audio decoding. Operation System: Android8.1.0. Support Maps: IGO, Google Map etc. Support 2D/3D Map Views: Yes. Dual Zone: Yes, navigating while music playing. Online Navi: Yes, support google maps online navigating. A2DP (Bluetooth Stereo Music): Yes, can play stereo music through Bluetooth. Bluetooth Music Control: Yes, play/pause/previous/next. PB-Download: Yes, can download phonebook from mobile to this unit. PB-Search: Yes, can use the first letter to search contact member in PB-Listings. Calling Records: Yes, Dialed Call, Received Call, Missed Call. Setup: Auto Answer, Auto connect, Device name. Built-in Microphone: Yes, on the front panel. FM Tuning Range: 87.5-108MHz. FM Increment: 0.05MHz(EU)/0.1MHz(US). Position: 2 USB Port, can be connected with Media/Camera/ Smartphone. Play MP5 Videos: Yes, can play RMVB Videos up to 1080P. Touch Music Title to play directly: Yes. Built-in Car Recorder App: Yes, just connect a USB Camera to use this function. Support HD CCD Camera: Yes. Play recorded Video directly: Yes. Storing Position: Nand Flash/GPS Card/USB Storage can be changed. DVR is Optional, Not include. External Port for TV Box: Yes, Support DVB-T/DVB-T2/ATSC/ISDB Box. Power Supply to TV Box directly: Yes, you can connect our TV Box to achieve this function. Touch Control the TV Box on unit: Yes, you can connect our TV Box to achieve this function. DTV-BOX is Optional, Not include. Built-in DAB Player App: Yes Connection Port: USB Power Supply to DAB+ Box directly: Yes Touch Control DAB+ Box on unit: Yes. DAB+BOX is Optional, Not include. You can connect a ELM327 Bluetooth OBD2 Scanner Tool to use this function. ELM327 Bluetooth OBD2 Scanner Tool is Optional, Not include. Tire Pressure Monitoring System, helps you monitor your tire pressure and temperature to increase your driving safety. TPMS BOX is Optional, Not include. Textbook: Could change font, font color, background color, bookmark, reading E-book while listening music. Photo Viewer: Support JPS, BMP, PNG, GIF etc. Wallpapers: 0 live wallpapers, 18 standard wallpapers, support DIY wallpaper from Gallery. APK Installer: Support Android Package installer. Support Torque Pro(OBD2 &Car): Yes, you can connect a Bluetooth OBD2 Scanner Tool to use this function. OBD2 BOX is Optional, Not include. Support Mirror Link function: Yes, Support screen mirroring from iPhone and android smartphone. Support TPMS: Yes, TPMS BOX not include. Sound: Key Tone & Volume. Storage: Display Internal Storage/Nand Flash/Connected Device Storage. Apps: Running Apps display/force stop/uninstall. Languages and Input: more than 180 Languages and choose input method. Date and Time: Setting Date&Time by yourself or choose GPS/network-provided time. GPS: Yes, GPS application options/monitoring/sound mode/mixing ratio. Driving safety: Watching Video, Reversing X-mirror/Volume, Reversing Trajectory/radar Display, Rear view ruler. BOOT LOGO: Code5678, 115 Open-Unit-Logos. Rear-View Camera Video In: One. L'item "7 Android 8.1 GPS Autoradio DAB+For VW Passat Seat Golf 5 6 Jetta Touran OBD SD" est en vente depuis le mardi 11 décembre 2018. Il est dans la catégorie "Auto, moto pièces, accessoires\Auto\ pièces détachées\Autres". Le vendeur est "romanauto88" et est localisé à/en EU Local Warehouse. Cet article peut être expédié aux pays suivants: Europe, Asie, États-Unis, Canada, Australie.